St. Alexander Yaroslavich Nevsky (Russian: Алекса́ндр Яросла́вич Не́вский; pronounced [ɐlʲɪˈksandr jɪrɐˈsɫavʲɪtɕ ˈnʲɛfskʲɪj] ( listen); 13 May 1221 – 14 November 1263) served as Prince of Novgorod (1236–40 and 1240–56 and 1258-1259), Grand Prince of Kiev (1236–52) and Grand Prince of Vladimir (1252–63) during some of the most difficult times in Kievan Rus' history. Commonly regarded as a key figure of medieval Rus', St. Alexander – the grandson of Vsevolod the Big Nest – rose to legendary status on account of his military victories over German and Swedish invaders while agreeing to pay tribute to the powerful Golden Horde. He was canonized as a saint of the Russian Orthodox Church by Metropolite Macarius in 1547. Born in Pereslavl-Zalessky, St. Alexander was the second son of Prince Yaroslav Vsevolodovich and of Rostislava Mstislavna, daughter of the Kievan Rus' Prince Mstislav Mstislavich the Bold (died 1228). Alexander seemed to have no chance of claiming the throne of Vladimir. 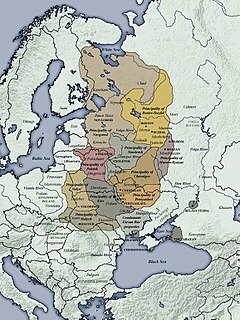 In 1236, however, the Novgorodians summoned him to become knyaz (or prince) of Novgorod and, as their military leader, to defend their northwest lands from Swedish and German invaders. According to the Novgorod Chronicle written in the 14th century (more than a century after the events it recorded), the Swedish army had landed at the confluence of the rivers Izhora and Neva, Alexander and his small army suddenly attacked the Swedes on 15 July 1240 and defeated them. The Neva battle of 1240 saved Novgorod from a full-scale invasion from the West. Because of this battle, 19-year-old Alexander gained the sobriquet "Nevsky" (which means of Neva). This victory, coming just three years after the disastrous Mongol invasion of the Rus' lands of the North West, strengthened Alexander's political influence, but at the same time it worsened his relations with the boyars. He would soon have to leave Novgorod because of this conflict. No non-Russian contemporary source mentions this supposed battle. The Chronicle identifies the alleged Swedish commander as "Spiridon" – while names after Saint Spyridon appear in both West and East, it is by far much more common in Orthodox lands than Scandinavia. Furthermore, Sweden had stood on the brink of war with Norway ever since the Norwegians' infamous Värmland expedition in 1225. Relations improved only after the Treaty of Lödöse in 1249, which was forged by the new Swedish strongman Birger Jarl. Before the treaty, Norway remained an ally of the Folkungs, giving them refuge and providing men and arms. In this situation, it seems unlikely that Sweden could have been able to organize a major expedition against Novgorod. Swedes are not known to have carried out any other military campaigns between 1222 and 1249, making the claims about their forceful appearance at the Neva with Norwegians as their allies in 1240 seem questionable. After the Germans and Estonians invaded Pskov, the Novgorod authorities sent for Alexander. In spring of 1241 he returned from exile, gathered an army, and drove out the invaders. Alexander and his men faced the Livonian heavy cavalry led by the bishop of Dorpat (Hermann, brother of Albert of Buxhoeveden). The Rus' force met the enemy on the ice of Lake Peipus and defeated the German knights and the Estonian infantry during the Battle of the Ice on 5 April 1242. Alexander's victory marked a significant event in the history of Russia. Foot soldiers of Novgorod had surrounded and defeated an army of knights, mounted on horseback and clad in thick armour. Nevsky's great victory against the Livonian Order apparently involved only a few knights killed rather than the hundreds claimed by the Russian chroniclers; decisive medieval and early-modern battles were won and lost by smaller margins than those seen in contemporary mass conflicts. After the Livonian invasion, Nevsky continued to strengthen Russia's Northwest. 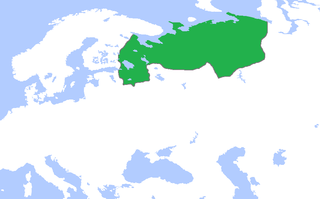 He sent his envoys to Norway and, as a result, they signed a first peace treaty between Russia and Norway in 1251. Alexander led his army to Finland and successfully routed the Swedes, who had made another attempt to block the Baltic Sea from the Russians in 1256. Nevsky proved to be a cautious and far-sighted politician. He dismissed the Roman Curia’s attempts to cause war between Russia and the Golden Horde, because he understood the uselessness of such war with the Tatars at a time when they were still a powerful force. Historians seem to be unsure about Alexander's behavior when it came to his relations with Mongols. He may have thought that Catholicism presented a more tangible threat to Russian national identity than paying a tribute to the Khan, who had little interest in Slav religion and culture. It is also argued that he intentionally kept the North Slav principalities and city states as vassals to the Mongols in order to preserve his own status and counted on the befriended Horde in case someone challenged his authority (he forced the citizens of Novgorod to pay tribute). Alexander tried to strengthen his authority at the expense of the boyars and at the same time suppress any anti-Mongol uprisings in the country (Novgorod Uprising of 1259). The Orthodox Church also emphasizes tolerating present civil authority of any kind more than other Christian churches (see Romans 13), which in this case would include accepting Mongol vassalage as divine judgement. According to one interpretation[who? ], Alexander's intentions were to protect scattered principalities of what would become Muscovy from repeated invasions by the Mongol army. He is known to have gone to the Horde himself and achieved success in exempting Russians from fighting beside the Tatar army in its wars with other peoples. Some historians see Alexander's choice of subordination to the Golden Horde and refusal of cooperation with western countries and church as an important reaffirmation of East Slavs' Orthodox orientation (begun under Duke Vladimir of Kiev and his mother Olga). He married a second wife named Vasilisa or Vassa shortly before his death. They had one son. Nevsky was buried in the Church of the Nativity of the Virgin monastery in Vladimir. Veneration began almost immediately after a miracle at his burial, when he supposedly extended his hand for the prayer of absolution. The remains of the prince were uncovered in response to a vision, before the Battle of Kulikovo in the year 1380, and found to be incorrupt. The relics were then placed in a shrine in the church. He was glorified (canonized) by the Russian Orthodox Church in 1547. A new wooden reliquery was made in Moscow in 1695 and the relics placed in it in 1697. By order of Peter the Great the relics were then removed from Vladimir on 11 August 1723 and transported to Shlisselburg, arriving there on 20 September. There they were kept until 1724, when they were brought to Saint Petersburg and installed in the Annunciation Church of the Alexander Nevsky Lavra on 30 August. In 1753 a large large silver shrine [ru] for the relics, made with 90 pounds of silver, was donated by Empress Elizabeth of Russia. With the completion of the Holy Trinity Cathedral of the Alexander Nevsky Lavra in 1790, the shrine and relics were transferred there at its consecration on 30 August, one of the saint's feast days. In May 1922, during the general confiscation of Russian Orthodox Church property, the shrine was opened. The elaborate silver shrine was transferred to the Hermitage Museum, where it remains. The relics were put into storage at the Museum of the History of Religion and Atheism, before being returned to the Holy Trinity Cathedral in 1989. His principal feast day is 23 November. A second feast day was instituted on 30 August in commemoration of the placing of his relics in the Annunciation Church. He is also commemorated in common with other saints of Rostov and Yaroslavl on 23 May. St. Alexander Nevsky's fame has spread beyond the borders of Russia, and numerous cathedrals and churches are dedicated to him, including the Patriarchal Cathedral in Sofia, Bulgaria; the Cathedral church in Tallinn, Estonia. On 24 September 2008, St. Alexander Nevsky was declared the main hero of Russia's history by popular vote, as reported by the Kommersant newspaper. ^ a b Begunov, K., translator, Second Pskovian Chronicle, ("Isbornik", Moscow, 1955) pp.11–15. ^ Värmland expedition by the Svenskt Militärhistoriskt Bibliotek. ^ The Chronicle of Novgorod, 1016-1471 - Google Boeken. Books.google.com. 28 November 2004. Retrieved 24 April 2014. ^ Tarkiainen, Kari (2008). Sveriges Österland. Från forntiden till Gustav Vasa (in Swedish). Helsingfors: Svenska litteratursällskapet i Finland. pp. 96–97. ISBN 978-951-583-162-0. ^ a b c d "Translation of the relics of St Alexander Nevsky". The Orthodox Church in America. Retrieved 23 April 2019. ^ a b c "Aleksandro-Nevskaya Lavra". rusmania.com. Retrieved 23 April 2019. ^ Kevin McKenna. 2009. "Proverbs and the Folk Tale in the Russian Cinema: The Case of Sergei Eisenstein’s Film Classic Aleksandr Nevsky." The Proverbial «Pied Piper» A Festschrift Volume of Essays in Honor of Wolfgang Mieder on the Occasion of His Sixty-Fifth Birthday, ed. by Kevin McKenna, pp. 277-292. New York, Bern: Peter Lang. ^ The US Liberty ship the S.S. Henry W. Corbett, launched in 1943 in Portland, Oregon, US was lent to the U.S.S.R. during WWII. After the war it was renamed by the Russian navy the Alexander Nevsky. Mikhail Yaroslavich, also known as Michael of Tver, was a Prince of Tver who ruled as Grand Prince of Vladimir from 1304 until 1314 and again from 1315–1318. He was canonized and counted among the saints of the Russian Orthodox Church. Saint Alexander Nevsky Lavra or Saint Alexander Nevsky Monastery was founded by Peter I of Russia in 1710 at the eastern end of the Nevsky Prospekt in Saint Petersburg supposing that that was the site of the Neva Battle in 1240 when Alexander Nevsky, a prince, defeated the Swedes; however, the battle actually took place about 12 miles (19 km) away from that site. "On April 5, 1713, in St. Petersburg, in the presence of Peter I, the wooden Church of the Annunciation was consecrated. This day is considered the official founding date of the Alexander Nevsky Lavra."